Our Office Coffee Service programs for Atlanta, Ga feature commercial brewers with free installation and maintenance. Our no hassle, no contract programs are designed to be flexible now, and in the future. We offer single cup, ground and whole bean office coffee programs. And yes, you can mix and match to create the perfect program for your office. 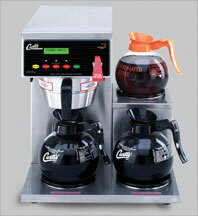 We carry commercial coffee Service brewers for single cup coffee, ground coffee and whole bean. your cost. You won’t get "stuck” with your old product. Startbucks, Caribou, Seattle’s Best, Godiva Wolfgang Puck, Maxwell House, Folgers, Donut Shop, Reunion Island and more to choose from. We will buy your old coffee back!